Tina ran 10K this morning in anticipation of eating at the Chip Shop. We knew this was going to be a heavy meal. I saw the BANNED BY THE HEALTH DEPT. sign on their menu next to the Fried Cherry Pie and I knew I had to have it. Any time someone tells me I can’t do something, I like to make sure I go and do it as soon as possible. So Tina and Phil, they actually buy stuff for $30 a week and live on it. They are big wine and bourbon drinkers, so that doesn’t factor into the $30, and they also live regular lives, going to friends’ dinner parties and going out every so often, but all the food they make in their home is done on $30 a week. I was super impressed by this fact. As an omnivore, I don’t know if I could do this, but it’s nice to think I could if I needed to. Of course, being invited to free lunches helps a lot! We had to try the fried pizza. I asked for Bleu cheese with this one and it turns out that Bleu isn’t so popular as a dipping sauce in England. Our waitress brought us a parmesan peppercorn instead and it worked better than tartar may have, but I still think I would have preferred this with Bleu. For sheer curiosity, it is worth an order, but don’t blame me when the dish called Fried Pizza feels exactly as bad for you as it sounds. This is what you come here for, right? 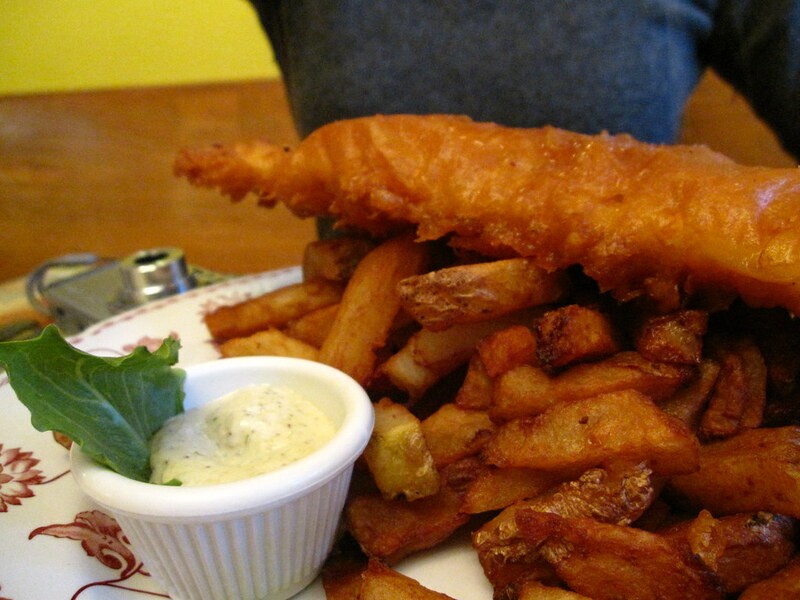 The fries are what the English call “Fat Chips,” meaning they are a thicker cut than a french cut fry. Occasioanlly, this means that they are not as crispy as I would prefer, but these guys were just right. The fish was exquisite. The fry is so thich that it literally lifted itself from the fisg and hardened, creating an air pocket inside the fish fry. It was a beer batter that stayed super crunchy for the entire meal. I bet these guys do a pretty good take-out business with their invincible crispiness. 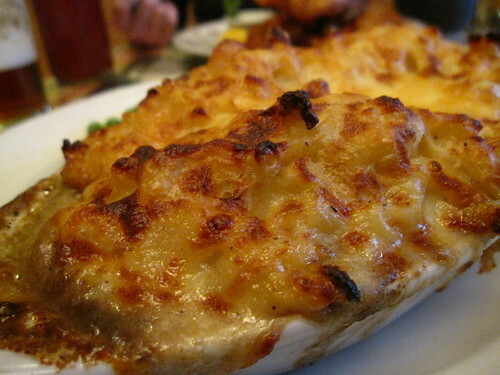 They are not joking about this macaroni being filled with wild mushrooms. I feel like the Kraft commercial when they kid that they want to call it cheese and macaroni, only I don’t know what I’d call this concoction. I had Tina take a few pictures of me holding up some of the interior but those didn’t come out so appetizing looking. It’s like one of the hostess cherry pies (link) deep fried in a (seemingly) lighter batter than that of the fish. Tina said “Oh, they’re really good with the whipped cream.” with a whimper. I think that sentence epitomizes the Chip Shop – so bad for you, you know it has to be good. Don’t think about the calories and you’ll love this place. Hedonists only need apply. The IRL Arts Foundation and The Wandering Foodie thank Park Slope Chip Shop for providing this meal. I'm a Brit and I have never heard of Chips being called “fat chips” before. Chips like the ones in the pic are just called chips. (We call the thin ones fries). 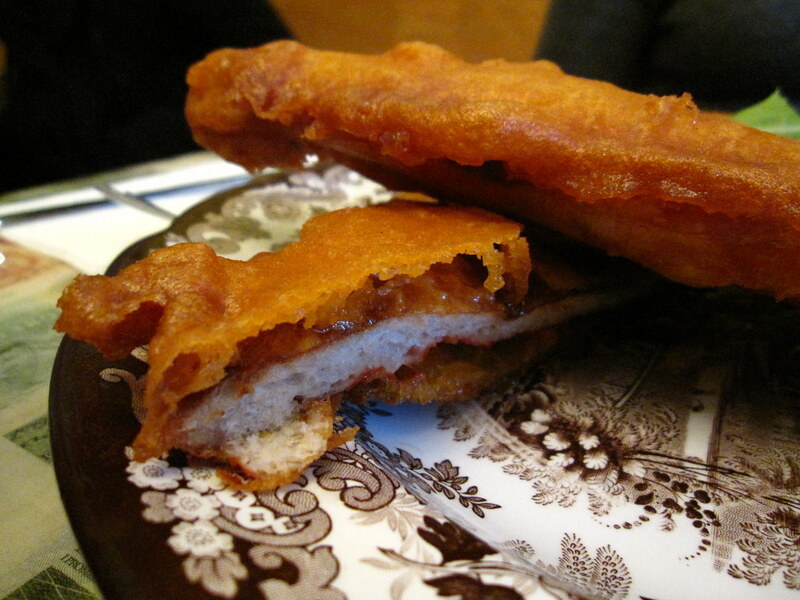 I've never heard of deep-fried pie before earlier, but have seen deep fried pizza when I was a student in Glasgow. The one in the photo looks far too posh though. 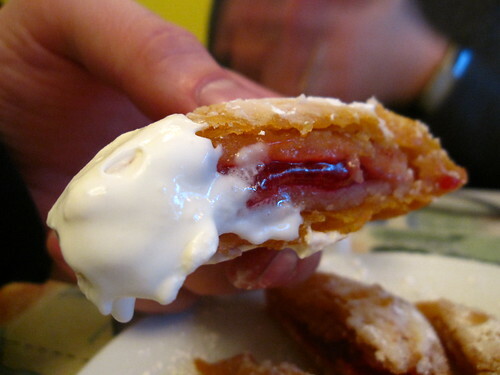 Deep fried mars bars are amazing but actually pretty difficult to get hold of. We spent most of an evening attempting to get one for an american friend who was visiting and eventually gave up. A lot of places won't do them because they sometimes explode and render the oil useless for the rest of the day!